Hello Dwellers and Welcome to the Basement...We're in the holiday season, and so this week's comic has the holidays in mind with a trio of tales starring Harley Quinn! 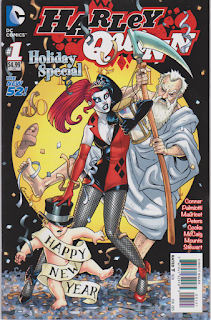 Christmas is next week (along with another day of personal importance to me involving births), and I figured why not have a couple of holiday comics lined up to talk about during this time of the year… and why not pick one to talk about featuring a complete nutcase… Harley Quinn! And it’s kind of fitting when you think about how this year, she has reached new levels of popularity thanks to Suicide Squad, and how the accurate portray of her relationship with the Joker manage to piss off the Alt-Left, it seems fairly topical still. After all, you can be jolly… you can be merry… but there is only one Harley. 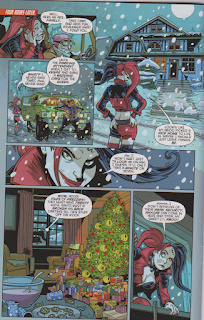 Now this week’s comic, ‘Harley Quinn Holiday Special #1’ was apart of DC’s New 52 Era… and needless to say outside of a few comics here and there, I didn’t really pay much attention to it, but there are certain things associated with it that stood out, in particular with Harley Quinn and her becoming a beacon of fun in the rather dark and depressing hole DC is digging itself out of with Rebirth. 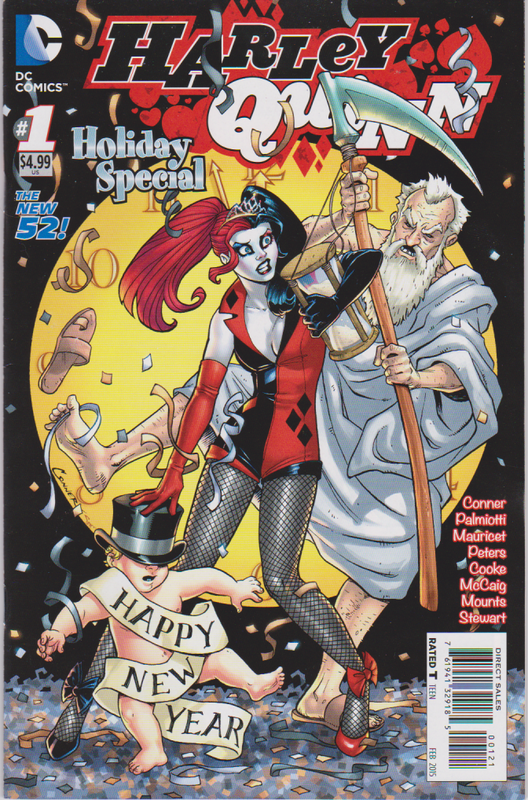 Anyway, let’s talk about this week’s comic, which does have a few variants, but the one I got has Harley Quinn pushing down a top hat on Baby New Year while elbowing Father Time away. It’s a fun cover with confetti all around indicating the clock just struck twelve (though the clock in the background indicates it’s 5 minutes to 12). It’s fun festive cover that ties in with one of the major holidays. Now with this being a ‘Holiday Special’, there are 3 stories in it, and 3 different types of art styles. The first ‘Bad Toy’, Harley’s cats and dogs got a little frisky and her base of operations is filled with new puppies and kittens, and being unable to take care of them all, a plan is struck to give them all homes on Christmas Eve… by helping people at the mall with their bags and sneaking a kitten or a puppy into them. Needless to say this is a clever plan, but not sure everyone who got a surprise pet will react kindly to it. However Harley got attached to one pug, and giving him away hits her a bit hard, so she goes to the local police station, and forces one of the cops to give her the address that matches that of a license plate so that she can check in on it to make sure the little guy got a good home… by breaking it and checking out the joint. She falls asleep and the next morning, a little girl named Linda wakes up eager to open her presents and is over joyed to see Harley under the Christmas tree. Harley is clearly not a gift, but Linda’s father makes a deal with Harley that if she makes Linda not want her, he’ll pay her $6,000 and look the other way about her breaking into his home. Harley agrees but it turns out Linda is a little hell raiser, and the two end up bonding… and eventually Linda tells Harley why she’s acting the way she is, a few years earlier her mom was killed going out to a store to exchange a gift that her father didn’t like, blaming him for her mother dying and has been sour on Christmas ever since. Harley being a former psychiatrist, realizes that Linda is dealing with some serious emotional trauma and also that her father is probably dealing with some heavy guilt every time December 25th rolls around, and comes up with a plan to help heal the wounds of losing a love one… by having Linda pretend to be sick of Harley who breaks out an ax in return for a ‘massacre’ all in a trick to have Linda’s dad ‘knock out Harley’, to fulfill the deal she made with him while at the same time and help kick start the healing process. This is a very touching story, very well done and paced, that presents Harley in a wonderful light and reminding the reader of what she was before she hooked up with The Joker. The artwork is nicely detailed and conveys the right emotion at key moments. The second story “Get Your Cheer outta My Ear’ sees an actual ‘ear worm’ get inside of Harley’s ear, singing Christmas tunes and only Santa can help… it’s a harmless story with some over the top art work that kind of contrasts the first story. The third tale, Killing Time, sees Harley discovering she has a gray hair and is told to blame ‘Father Time’, so Harley figures she can take out the guy who symbolizes the passage of time… but she ends up going to a old folks home where a resident with the last name ‘Tyme’ is staying… and you can see where this is going, it’s a total case of mistaken identity fueled by Harley being a nut which gets resolved with the old-timer’s new born grand baby pulls Harley’s gray hair out and basically realizing she can’t stop time… we’ll she is told she can’t stop time. This story does have a nice sweet ending for Harley used her animals to pull her on a sled to the hospital, and when she is leaving she discovers they have found old folks to be around… so unintentionally, Harley brought some joy to a bunch of folks and declares that ‘this is gonna be the best year ever’ as she walks home. The third story is okay, if a little ham-fisted with the message it was trying to get across while reminding the reader that yes Harley is a loon. The art work is light and basic, not as detail as the first story, but certainly nicer to look at than the second story. 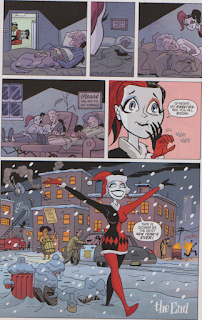 VERDICT: Harley Quinn: Holiday Special #1 is a decent collection of Holiday themed tales, with two dedicated to Christmas and one for New Years, with as you can guess the first story being my personal favorite as it had Harley as fully fleshed out as a character. The art work differences between each story is a bit jarring, with the first and third stories having similar but clearly difference styles and the 2nd story being very over the top. 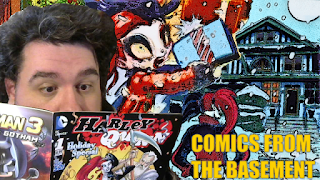 If you’re a Harley Quinn fan you’ll love this comic, and if you’re not, its certainly a nice comic to add to the collection as it’s a nice read. Next Week being Christmas Week, I have a very special comic to review that is a bit biblical in the story it tells.